Fall In Love With Your Backyard Again! At Hollywood Pools and Spas, our goal is to provide every customer with a safe, beautiful and enjoyable swimming pool and spa experience. Successful residential pool building requires a thorough understanding of artistic design and building science. We are sensitive to the disruption a major home improvement project can cause, so we focus on precise preparation and planning in order to maintain a strict construction schedule. Residential pools serve as a showcase item for your home, so we always begin with a meeting to discuss your ideas and concerns. We cover every detail of the process in order to determine exactly which features and options will satisfy your expectations without breaking your budget. Once we have your input, one of our pool designers will begin developing working plans and drawings to show you exactly how your pool or spa will integrate with your existing landscape. Groundbreaking only begins when you are completely satisfied and approve the site layout and overall design. The construction process is vital to avoid critical structural issues caused by inferior materials or shoddy workmanship. When your pool is completed, you can rest easily knowing it has been built to last. Permits: Once you approve the pool design, we secure all the necessary building permits. Excavation and Reinforcement: We clear the site area and lay reinforced steel rods that will support your new pool. The plumbing rough-in is also completed during this stage. Applying the Gunite: A mixture of sand and concrete, gunite is sprayed over the reinforced steel pool supports. When completed, this serves as the foundation and shell of your swimming pool. Surface finishes are applied after the shell has cured. Grading and Finished Plumbing: When the shell is completed, the deck area is graded and compacted to reduce the chance of cracking. The balance of the plumbing network is installed, and the system is pressure-tested. Deck Construction and Tile Installation: Forms are erected around your pool, and the concrete is poured. The tile is also installed around the waterline during this stage. Pool Equipment Installation: All of the filtration and circulation equipment is installed including pumps, filters and other selected options. Finish and Startup: After the equipment is installed, the pool is cleaned and treated with a special finish. When filled, the pool surface is brushed, and a chemical treatment is applied. Your completed pool will take about a month to cure before it is ready to use. 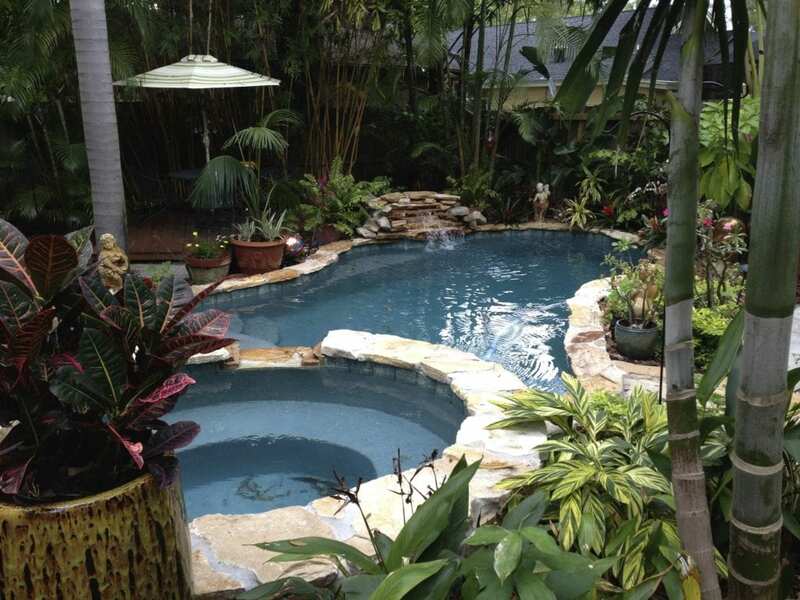 If you live in Pinellas County or Hillsborough County, Hollywood Pools and Spas can help turn your backyard into the ultimate outdoor retreat. We create vanishing edges, beach entries, faux rocks, waterfalls, slides, lighting effects and fountains to enhance the splendor and ambiance of your backyard. Your new pool will provide endless hours of outdoor fun and increase the value of your home. Call one of our friendly representatives to learn more about the many benefits of installing a new pool and spa. If your commercial property would benefit from having a swimming pool, you want to hire a contractor who’s experienced and knowledgeable in every aspect of the commercial pool building process. A well-built pool will last for decades and provide solid value and a superior return on investment. Commercial pools are subject to significant safety and regulatory demands. At Hollywood Pools and Spas, our designers and craftsman have many combined years of experience addressing the unique challenges presented in a commercial pool build. Commercial swimming pools undergo a much higher level of stress and abuse when compared to a residential pool. As a business owner, you recognize that a public facility must be safe, durable and built to exacting standards, especially with the extreme Florida summer weather we experience. From the initial design phase through construction completion, quality is always our number one priority. We install beautiful and functional commercial pools at competitive prices, and you will enjoy positive cash flow since maintenance and repair costs are minimized. Unique Requirements: A commercial swimming pool has unique requirements that can only be adequately addressed by a pool contractor who understands the entire design and construction process. The differences between a conventional pool and commercial pool are enormous. Your pool will need a well-engineered commercial pump, filtration system, and properly sized sanitation equipment. Safety is the Top Priority: Commercial pool usage is varied and constantly changing, so the materials must be exceptionally abuse-resistant. During the design phase, we account for all of the federal, state and local building code regulations that will affect the construction of your pool. Throughout the entire project, we constantly monitor construction activity and only install features that have a proven track record of safe use in a commercial setting. Maintenance and Service: Commercial pool service and maintenance reduce bottom-line profits, so all of our commercial pool installations are designed to minimize operating, maintenance, and repair costs. 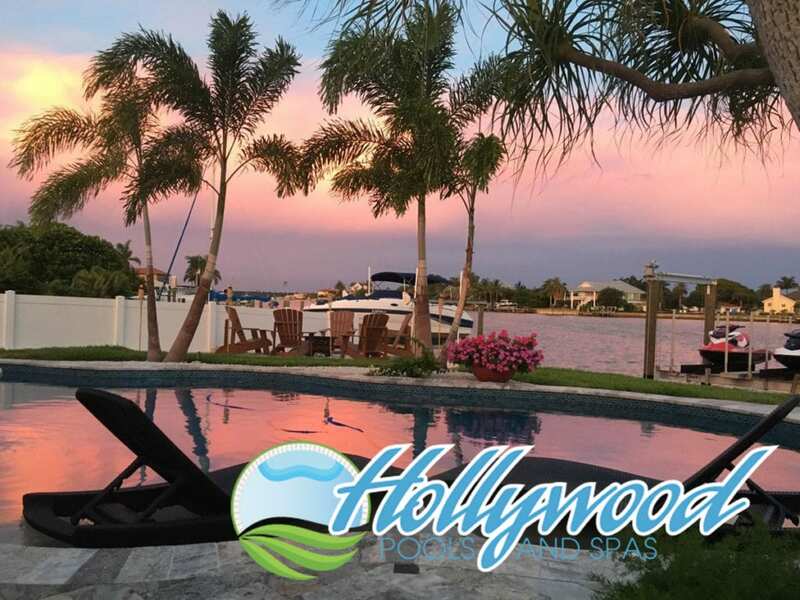 From apartment complexes to hotels, schools, recreational facilities and master-planned communities, Hollywood Pools and Spas is the only source you need for complete commercial pool building services. Call today to talk with one of our commercial pool design specialists to learn more about the many benefits of installing a commercial pool.